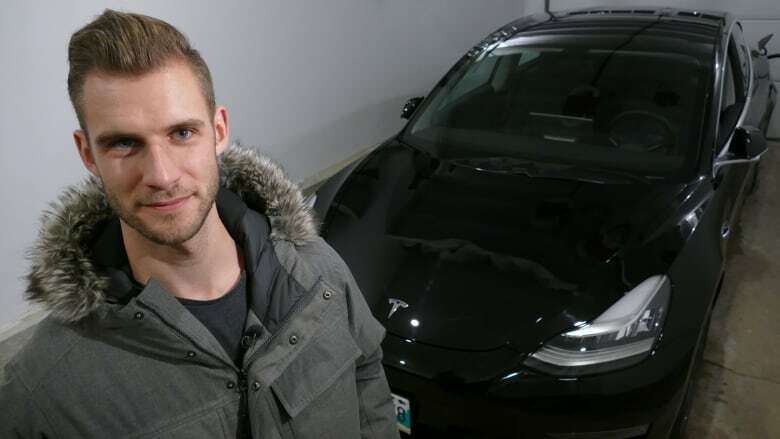 Electric vehicles lose lots of battery power to keep the car warm during Canadian cold snaps, but turns out that isn't a huge hindrance for Winnipeg commuters like Jordan Loewen. Electric vehicles lose lots of battery power during Canadian cold snaps, but turns out that isn't a huge hindrance for Winnipeg commuters like Jordan Loewen. 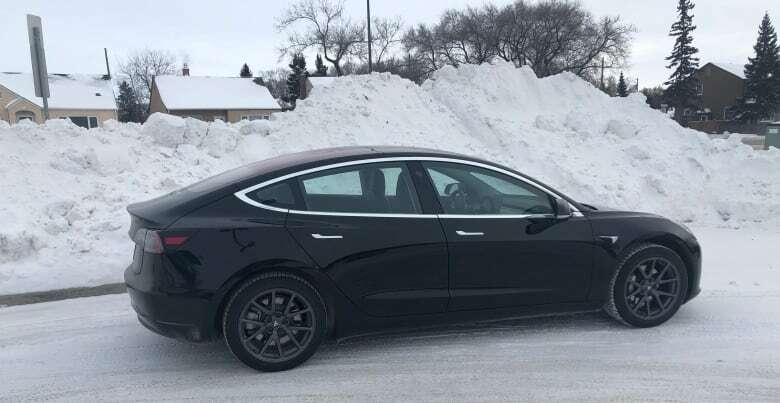 "It performs and handles well in our winters, exceptionally so," said Loewen, 32, his breath visible as he stands beside the black Tesla 3 sedan he purchased new last summer. "I'm kind of a guinea pig. I was surprised." His car can drive from Winnipeg to Brandon and back on a full charge under ideal conditions, though conditions haven't been so ideal in Manitoba lately. For several days last week, temperatures seemed to freeze around the –34 C mark, with wind chill values hovering around –40 to –50. On Jan. 29 alone, CAA Manitoba hit a daily record of 3,700 service calls from drivers stranded with dead batteries or other unplanned cold weather-related inconveniences. Loewen lost about 200 kilometres (40 per cent) of his 500 km range on the coldest of those days. Heating the car accounts for the bulk of the energy loss in the winter. 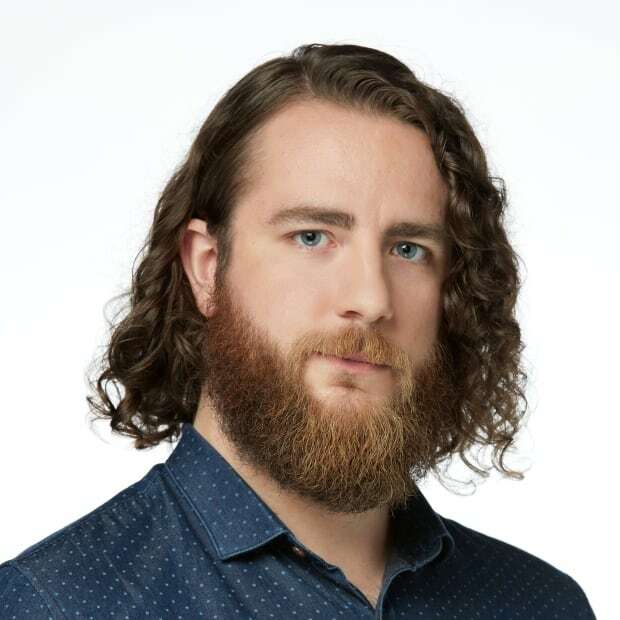 But as someone who drives less than 60 km per day — like many commuters in Winnipeg — the loss doesn't make any difference in practical terms, he said. In fact the heat, activated through an app on his phone or the large touch screen on the dash, is one of the many winter perks. 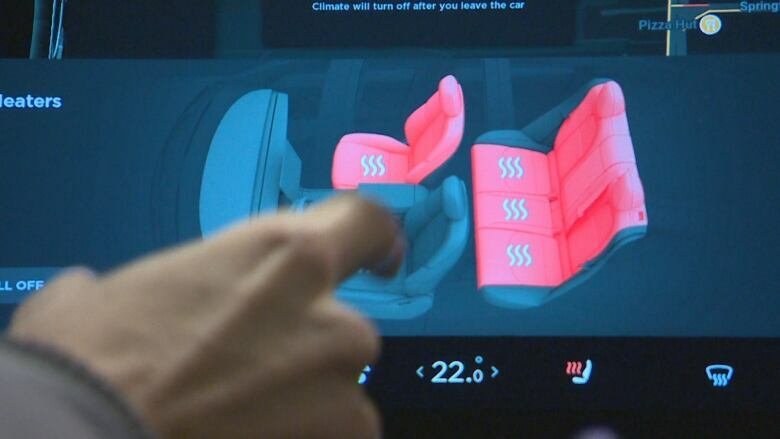 Within five minutes of turning it on, the windows are thawed, the seats are toasty and the cabin temperature is above 20 C.
"It makes people jealous when we go to my vehicle after going out for a meal or something," Loewen said. "It's warm and people aren't shivering or sitting in the back seat blowing smoke out of their mouths because they're just waiting for the vehicle to warm up. And you don't have that cold Winnipeg winter vehicle that just, like, shudders and stalls and makes all that noise in the vehicle." Tesla advises against exposing vehicles to temperatures below –25 C or above 60 C for more than 24 hours at one time because damage may occur, but Loewen hasn't seen any issues. It's Loewen's first winter with the high-end vehicle, for which he paid a cool $75,000. In some ways, Ross Redman and his little blue hatchback represent another end of the electric vehicle spectrum. 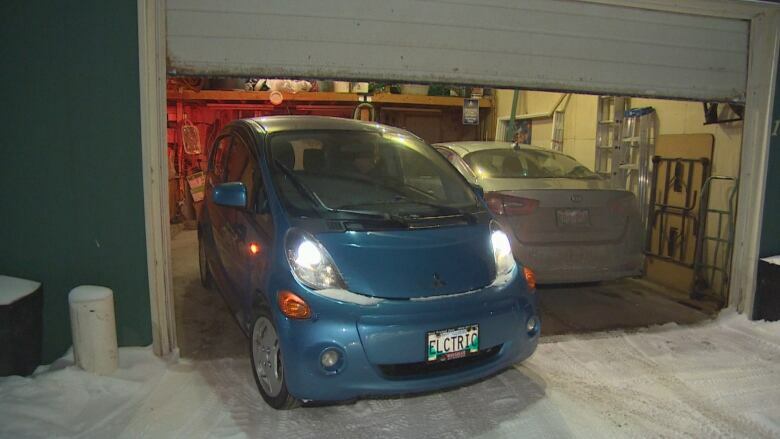 "It's got lots of get up and go," said Redman, shivering slightly next to his metallic blue Mitsubishi i-MiEV. Redman bought it brand new in 2012 for about $26,000. It can go 150 km in ideal conditions but only 100 km on Winnipeg's coldest days. "I typically don't drive 100 kilometres in a day so who cares," Redman said. He touts the fact that his vehicle only costs about $7 per month in the summer and $10 in the winter in electricity bills. It always starts, he said, and the battery has been robust enough to boost many stalled vehicles, including a pickup truck that died in his back alley this winter. "He was totally amazed that this little car would run in this cold and would be capable of boosting his truck," he said. 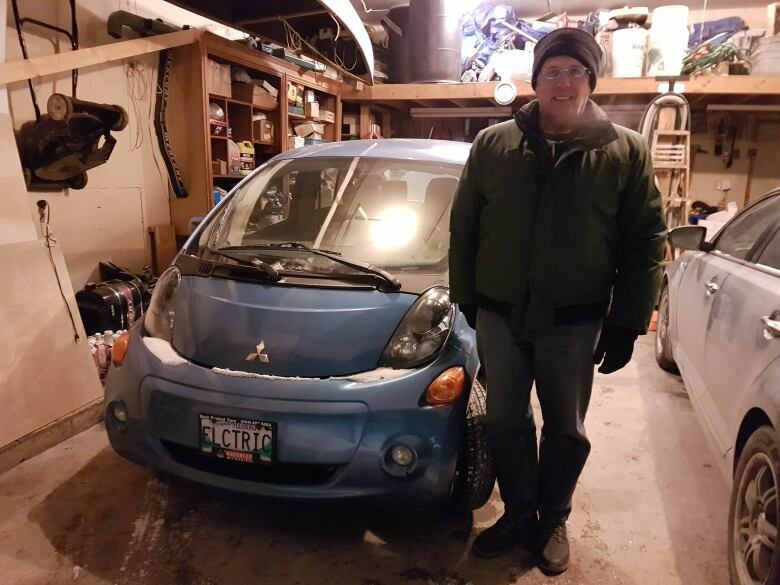 "I've been told by several people that an electric car will never work in the winter time, and I use it every day." Redman said winter range loss isn't a limiting factor for city driving, but long-distance travel is a year-round problem in Manitoba. "If I could have anything, it would be a charging station in every city and major town in the province, and then I could go anywhere." Loewen and Redman have Level 2 charging stations installed in their garages that charge their vehicles fully overnight. And though technically anyone can plug into a conventional outdoor outlet, considered a Level 1 station, those only provide a trickle charge that takes longer to power up the car. Want to tour Manitoba, and you could be in trouble. 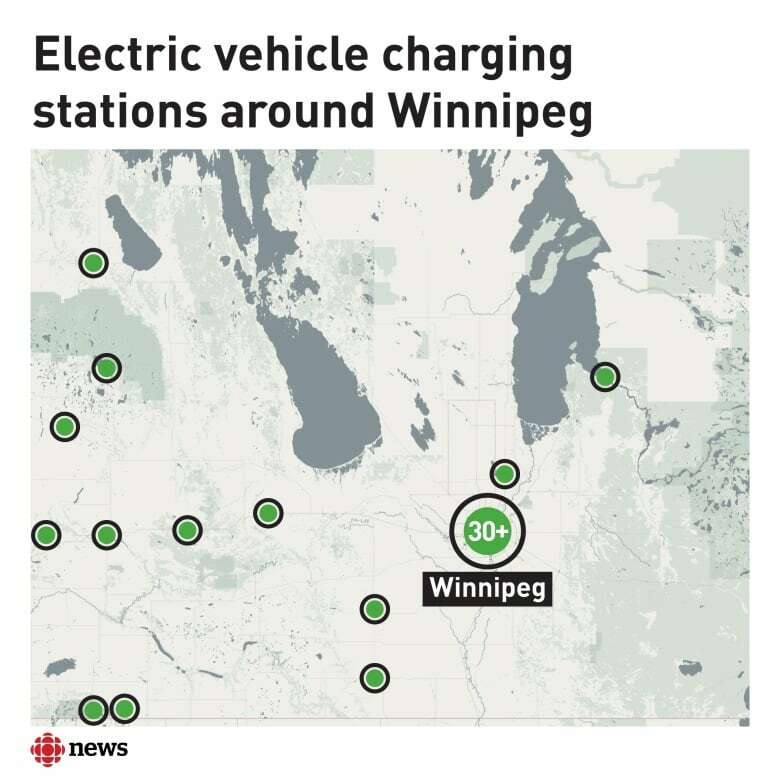 Right now Manitoba is a patchwork and lacks a network of Level 3 fast-charging stations, designed to juice up cars in under an hour. Redman questions whether the current Manitoba government is committed to making that network a reality in the near term. "There's no political will in order to switch over and stop producing CO2 [carbon dioxide]," he said. Manitoba Electric Vehicle Association president Robert Elms hopes that's not true. "The government is certainly saying to us that they want to get this into action as soon as possible and we are hoping that that's the case," Elms said. "In the introduction to the climate green plan, the premier said that Manitoba has a record as a clean, green province, but then he bluntly told us it's time to do even more. He said climate change is real and it's already impacting us." Elms represented MEVA on a transportation sector working group that had until last Thursday to submit recommendations for how to implement Manitoba Sustainable Development's green strategy. MEVA tabled 10 recommendations. They want the province to invest $4 million in the creation of a supercharger network that would open Manitoba's vast expanses to electric owners wanting to do long trips. Another suggestion is for the province to transition its entire fleet of vehicles to electric. Elms estimated the move could save taxpayers $100 million annually in energy and maintenance costs in the long run. Elms admits the upfront sticker price deters some from going electric, which is why MEVA is asking the province to follow the success stories of other provinces and municipalities and provide a tax incentive to prospective buyers. That could spur electric sales in Manitoba, which has already seen demand rise, Elms said. 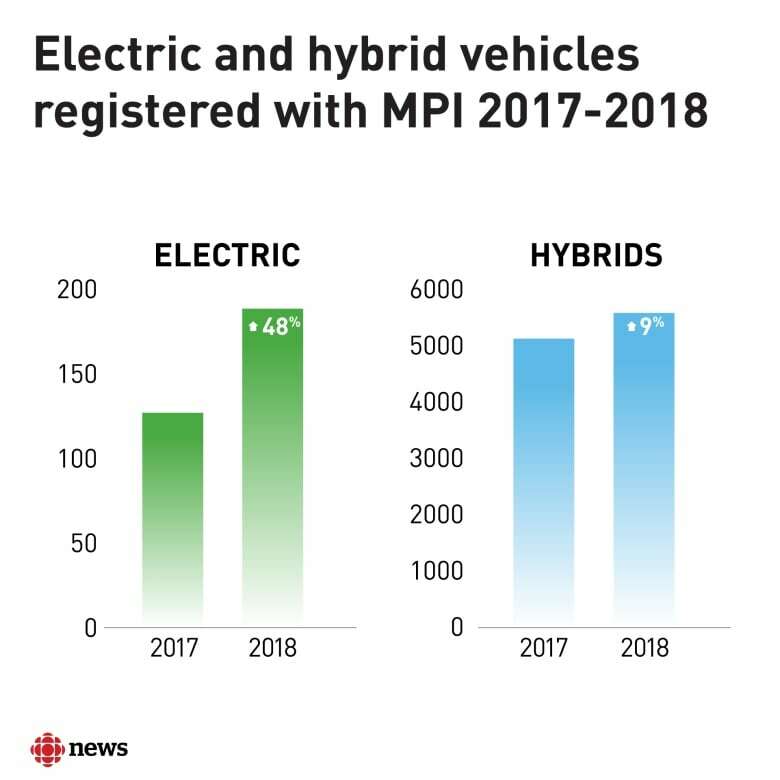 Manitoba Public Insurance spokesperson Brian Smiley said the number of electric vehicles registered in the province jumped 48 per cent between 2017 and 2018 — from 126 to 187. Over the same period, the number of registered hybrids rose from 5,079 to 5,529, a nine per cent increase. Sustainable Development Minister Rochelle Squires said "measurable and cost-effective" greenhouse gas emission reduction initiatives, proposed by MEVA and others on the working group, will be reviewed by an "independent expert advisory council" that will then make further recommendations to government. "Our government is committed to meaningful consultation with environmental, business and community leaders and representatives as we work towards the collective goal of becoming Canada's cleanest, greenest and most climate resilient province," Squires said in an emailed statement. The electric vehicle revolution is coming, but is the infrastructure in place to maintain it?